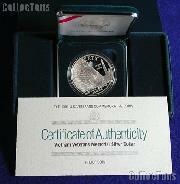 We are pleased to offer for sale this 1994-P Vietnam Veterans Commemorative Proof Silver Dollar. This 1994-P Vietnam Veterans Commemorative Coin was produced by the United States Mint and is specially designed and created to commemorate the men and women who served the United States of America in the Vietnam War. This 1994-P Vietnam Veterans Proof Commemorative Dollar is comprised of 90% silver (0.76 troy ounce) and 10% copper with a diameter of 38.10mm and a weight of 26.73 grams. There were 227,671 1994-P Vietnam Veterans Commemorative Silver Dollars minted at the Philadelphia (P) Mint. This Commemorative Silver Dollar is in Proof condition. The obverse of the 1994-P Vietnam Veterans Silver Commemorative Dollar was designed John Mercanti and features an image of the Vietnam Veterans Memorial in Washington, DC. The reverse of the Vietnam Veterans Silver Dollar was designed by Thomas D. Rogers, Sr. and features three Vietnam War service medals. This 1994-P Vietnam Veterans Silver Proof Commemorative Dollar Coin is encapsulated and comes in the original U.S. Mint packaging with a Certificate of Authenticity (COA). These coins are a great value for the price! Don't miss out on this 1994-P Vietnam Veterans Commemorative Proof Silver Dollar!